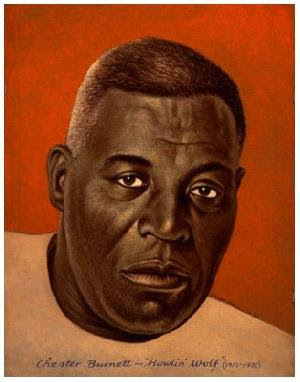 Here is a typical song of the legendary blues singer Howlin' Wolf. Chester Arthur Burnett (1910 – 1976), better known as Howlin' Wolf, was an influential blues singer, guitarist and harmonica player. With a booming voice and looming physical presence, Burnett is commonly ranked among the leading performers in Chicago blues. Many songs written or popularized by Burnett – such as "Smokestack Lightnin'", "Back Door Man" and "Spoonful" – have become standards of blues and blues rock. Born in White Station near West Point, Mississippi, he was named after Chester A. Arthur, 21st President of the United States, and was nicknamed Big Foot and Bull Cow in his early years because of his massive size. He explained the origin of the name Howlin' Wolf thus: "I got that from my grandfather." He used to tell him stories about the wolves in that part of the country and warn him that if he misbehaved, they would "get him". As a youth he listened to Charley Patton, who taught him the rudiments of guitar, as well as to the Mississippi Sheiks, Tommy Johnson, and Jimmie Rodgers, whose famous "blue yodel" Burnett integrated into his singing style. His harmonica playing was modeled after that of Rice Miller (also known as Sonny Boy Williamson II), who had lived with his sister for a time and taught him how to play. He played with Robert Johnson and Willie Brown in his youth. At 6 foot, 6 inches (198cm) and close to 300 pounds (136 kg), he was an imposing presence with one of the loudest and most memorable voices of all the "classic" 1950's Chicago blues singers. Howlin' Wolf's voice has been compared to "the sound of heavy machinery operating on a gravel road". Although the two were reportedly not that different in actual personality, this rough edged, slightly fearsome musical style is often contrasted with the less harsh but still powerful presentation of his contemporary and professional rival, Muddy Waters, to describe the two pillars of the Chicago Blues representing the two sides of the music. 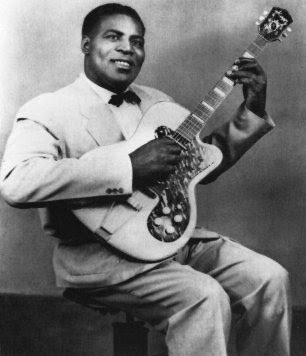 Howlin' Wolf was featured as a super-hero in one of the Marvel comics. 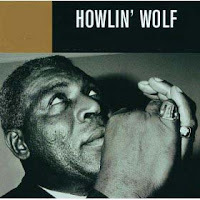 Enjoy Howlin' Wolf's soulful singing! Hello, quite a nice site you have. was my great friend and mentor. I would appreciate it very much for you to tell me the sources of those derived images, and if they are being marketed commercially. Also PLEASE place my copyright on them bottom of each images ... as "©s g schoenfeld - www.howlingwolfphotos.com"
A further link within your video would please many Wolf fans, I'm sure, too. Thank you for your attention to this. I am not directing it to my representative Getty Images as I know your tribute is for love not money. Congratulations on your nice site/blog spot.